SKU: PIN-UNI. Categories: Brooches & Clasps, Animal Pins. Pure of Heart, Proud, Untamable. Do you believe in unicorns? 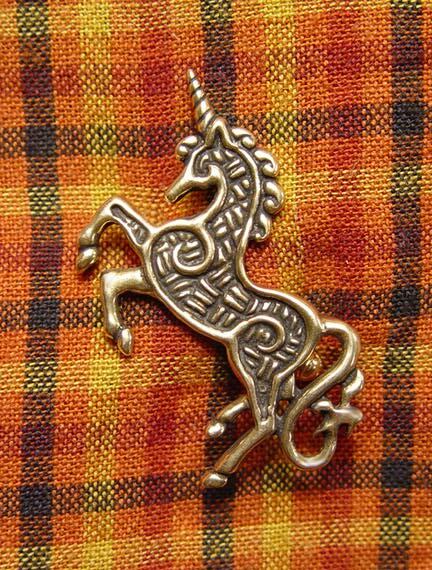 Our Unicorn Pin will turn you into a believer in no time! Available in both bronze and sterling silver, this pin is 2.25” by 1.5″ (56 x 38 mm). It features a modern pinback suitable for pinning to most any clothing. The presence of the unicorn can be found in the mythology of the Greeks, the art of the Indus valley and India, and the words of the Christian Biblical translations. Even today, the tale of this magical beast excites the imagination of children and adults alike. The ‘unicorn’ in question was quite possibly the large ungulate known as an auroch which was a large, fierce, horned beast that came to symbolize strength. Be that as it may, the unicorn is mentioned no less than 8 times. And because of this translation, the unicorn became a religious symbol in the art of the Middle Ages. Through the years, a tale was told of a beautiful maiden representing the Virgin Mary who managed to trap a unicorn simply by being pure of heart and mind. As she sat in the forrest, the heretofore untamable beast came to her and lay its head in her lap. As the legend grew, the unicorn came to represent Christ who asks of his followers to be pure of heart and spirit. So strong was the belief in the purity of the unicorn, that a herd of unicorns is called a “blessing”. Many natural history accounts describe a beast similar to the mythological unicorn. Some say that the animal has the body of a horse, while others state that it resembles a large goat with a lion’s tail and cloven hooves. All accounts, however, mention that the animal possesses one large horn growing from the center of it’s forehead. One account, which was obviously a description of a rhinoceros, describes a great unstoppable beast that was ugly to look and that liked to roll in mud baths!